Our Feature Presentations this week include a couture Designer Pillow, hand dyed silk Shibori Ribbon and the book 'Designer Needle Felting' which features contemporary felted projects with designer flair. Created as a "Thank you" gift for our talented web designer Ivan Meade, our feature project was inspired by his favorite period photo of Salma Hyack. First, the image was printed onto a sheet of EQ Printables Premium Cotton Satin Inkjet fabric. For stability we then bonded it to a piece of flannel backed cotton using the ultra thin sheer fusible Misty Fuse. 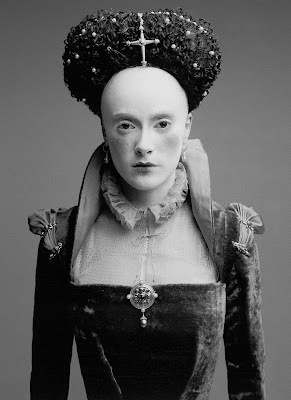 The image was then "framed" using silver and black silk fabric as matting. This was bordered by a row of 1/4" velvet piping and a fine row of beadchain trim. To accentuate the pleating detail of the photo, we incorporated silk Shibori Ribbon in color Cool Ash as a secondary border along with another row of piping. 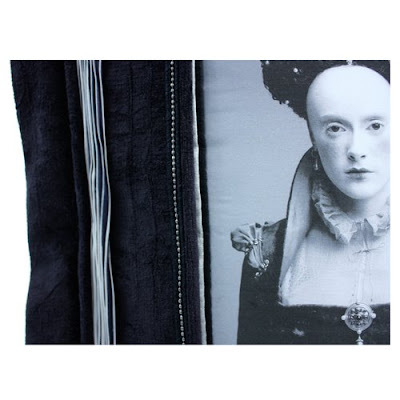 A beautiful crushed black velvet was chosen as the primary fabric and a silver colored silk was used for the inset gusset on each side to create the boxing effect. Silver bead clasps and black ribbon complete the detailing. The finished pillow is 18" x 18" square with a boxed down and feather pillow fill. We were very pleased with the completed pillow. Ivan was thrilled with his "Thank you" gift and it now rests on the "best seat" in his studio! 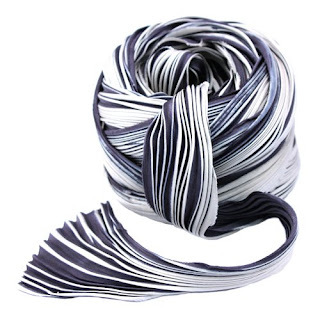 One of our favorite products is silk Shibori Ribbon - luscious 4" silk ribbon that is Shibori hand dyed and pleated. What is Shibori? Shibori is the collective term for tie-dye, stitch-dye or pole wrap-dye. The most common English translation is "tie-dye" but it is more aptly referred to as "shaped resist dyeing". 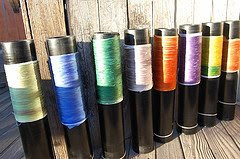 Silk fabric, or in this case ribbon, is tightly wrapped around a cylindrical tube - most often a PVC pipe. The fabric is "scrunched" down on the tube and once secure can be dyed in a multitude of colors. The tight folds act as a type of resist and the beautiful striping effect is the result. 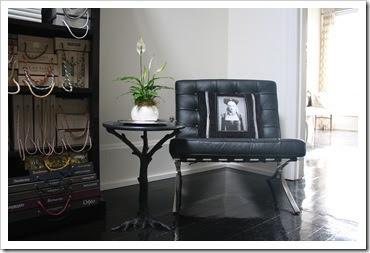 We chose to use the color Cool Ash in our Feature Designer Pillow project. Our online store currently carries twelve different colors of Shibori Ribbon and we will be adding eight additional new colors in the next few days. 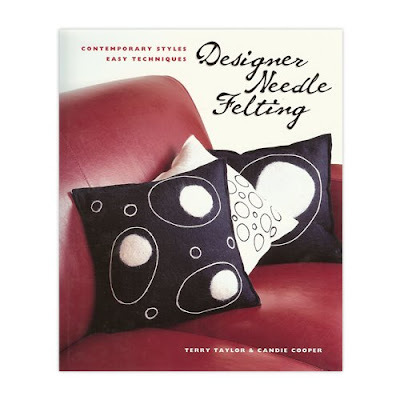 Authors Terry Taylor and Candie Cooper introduce contemporary styles and easy techniques in this hands on guide to Designer Needle Felting. This colorfully illustrated guide shows how easy it can be to get eye-catching results on everything from wonderful wearables to whimsical home accessories. From Shibori Felted Scarves to the bold black and white Bubbles Pillows, twenty five innovative projects will introduce you to the exciting technique of needle felting. All the basics, including information on wet and dry felting, are fully covered. 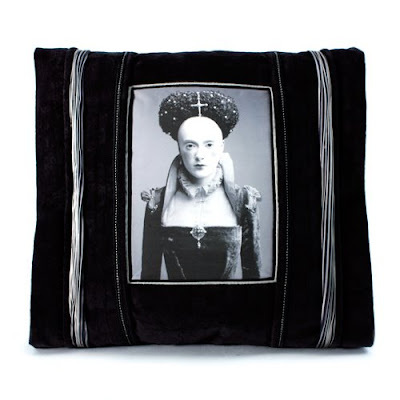 Well, I have to say that I am the luckiest receiver of this gorgeous pillow, which has become the star in our studio. Everybody is blown away with the attention to detail in this master piece done by Delores. I also wrote an entry about this pillow in my blog. Thanks for sharing. I love beautifully crafted pillows. The thrill of surprise for the receiver and the lasting impression that lingers. Plus the ultra modern color. 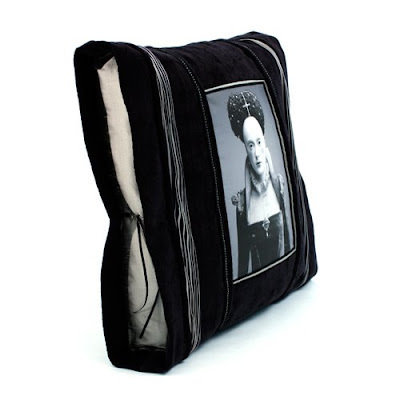 How fun I can't wait to try a pillow for an anniversary using a wedding photo, baby photos etc. Gosh see this is how it starts.....Thanks!